Form guests in english - 4doerfertreffen2019s Webseite! 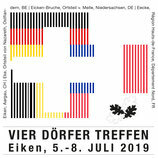 You are already in touch with a host in Eiken and/or you had a private accommodation at the last "Vier-Dörfer-Treffen" in Eiken. So please give us the personal details of your host. I don't need a private accommodation, i prefer..